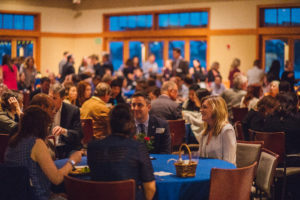 The San Diego Section of the American Planning Association (SDAPA) held its end-of-season awards banquet on Thursday, May 17th, at Coronado’s charming Community Center. The annual awards dinner is a time to recognize people for their accomplishments and allow them to eat, drink, and offer a salute to local businesses and sponsors. Over the last few years, the event has evolved into a premier event in the region, attracting regional business, academic, legislative, and civic, and planning leaders. Presiding over the ceremony was Awards Chair Mike Strong. 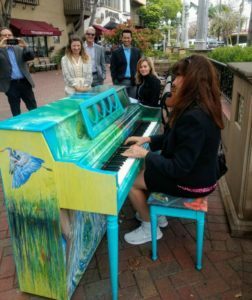 The awards dinner, held on May 17, 2018, was a spectacular event, starting with a walking tour led by Peter Fait through the Coronado’s visually stunning strand and downtown, which included playing the piano in the lovely outside setting. Award banquet attendees assembled in the Nautilus Room at the Coronado Community Center to mingle and buy raffle tickets before dinner. Guests were also treated to the sweet sounds of Michael Gonzo, performing live, and were provided spectacular views of Glorietta Bay, beyond. 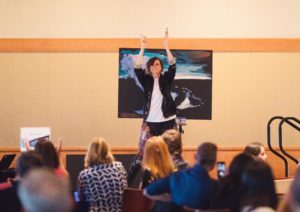 The evening program opened with an extraordinarily unique and mesmerizing art performance show from Amy Berkman, incorporating speed-painting, choreography, and music onto canvas. A grand introduction was provided by Mayor Pro Tem Bill Sandke, who officially welcomed SDAPA to Coronado. The crowd was also entertained by a singing tour group from Coronado School of Arts, highlighting the talent of local youth. 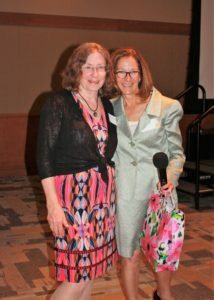 To kick off the awards, Section Director Rachel Hurst honored Betsy McCullough, the first woman in the San Diego region to be inducted into the Fellows of the American Institute for Certified Planners. Betsy was inducted into the FAICP at the National Planning Conference in New Orleans in April 2018. Congratulations Betsy McCullough, FAICP! The Section Awards Jury gave 16 awards – including excellence awards, achievement awards, and 5 Honorable Mentions – to projects and individuals who make contributions to planning in San Diego. These awards, which are among the highest honors for achievement in the industry, are made in various categories; however, all of these awards recognize good planning work. The Awards Jury, which is overseen by the SDAPA Awards Chair and Board members, select the recipients of these awards on the basis of nominations submitted by a wide range of professionals, firms, and institutions. Each jury member offers expertise in particular areas of community development research or practice. Further information about the award recipients and their award citations are shown below. Most of the awarded projects and individuals are eligible to compete at the California Chapter level in those awards categories. As Awards Chair, I am pleased to announce the recipients of the 2018 SDAPA Awards. Fehr and Peers specializes in providing transportation planning and engineering services to public and private sector clients. This planning and engineering firm has been in business since 1985 and in San Diego for a decade. The awards jury thought that Fehr & Peers demonstrates consistent quality in graphic design, content, and service – from all stages of a project from initial ideas to concepts and then to construction drawings. Emerging Planning and Design Firm Award – CityPlace Planning, Inc.
CityPlace was founded in 2009 and already has a proven track record of success in the industry. The awards jury felt that the firm has enhanced environments by creating real, visionary places through planning. Recent projects include the Downtown Vista Specific Plan, Lemon Grove’s Health and Wellness Element, and Escondido’s South Centre City Specific Plan. Not only are they dedicated to producing plans with meaningful impact, but they also give back to the profession to ensure there will be future planning leaders to carry out the mission. The Grantville Trolley Station/Alvarado Creek Revitalization Study outlines a strategy for revitalizing Alvarado Creek, solving longstanding flooding issues, and improving connectivity around the Grantville Trolley Station in San Diego, to enable revitalization of the area into a vibrant, mixed-use, transit-oriented community. The awards jury was impressed with the many facets of the work and potential layout. The Study scope consisted of an approximately 102-acre area and outlined precisely the extent of flooding issues, and synergistic neighborhood planning, urban design, and hydrologic modeling to outline creative solutions to meet multiple objectives, and achieving creek restoration and environmental-sensitive flooding solutions in an urban setting. The Plan identifies mixed use opportunities along commercial corridors in the Village areas, which provide the greatest propensity for change with infill development that is in proximity to transit. The community includes two trolley stations. Active transportation improvements support the established and growing transit system in San Ysidro. The awards jury spoke highly of the plan’s engagement process and also the way the plan includes new ideas to build cohesive and active living. By focusing on first and last mile connections to transit and connections to local services, it improves the environment for those who already wa lk and bike within the community and sets the stage for improvements that will encourage more people to use it. The Community Plan addresses the major city and regional planning challenges while still capturing the eclectic nature of the North Park community. The awards jury felt that there was a super team of talent doing a lot of the work. And it paid off. The Community Plan consists of a strong urban design vision that embraces the street with a multitude of policies promoting active building frontages, plazas, and wider sidewalks for increased pedestrian activity and place making. Recently completed projects along El Cajon Boulevard, 30th Street, University Avenue and Park Boulevard are a testament of the positive impacts of the North Park Community Plan. A number of high density market rate, affordable housing, and senior housing projects have made a huge difference. The National City Downtown Specific Plan provides the framework for future development and supporting public improvements for a 158-acre district for downtown National City. The Specific Plan provides a comprehensive land use, parking, and circulation plan along with design guidelines that support the Specific Plan’s goals and policies and guides future public and private development. In addition, the Specific Plan includes a strategy for its implementation and mechanisms to ensure that development will be coordinated to be smart growth and promote smart parking policies, encourage appropriate development, support housing, and encourage transit supportive development that allows people to live with less dependence on single-occupancy vehicles. The City of Escondido’s 2013 Comprehensive Economic Development Strategy (CEDS) and CEDS Implementation Plan outlined over 40 individual action items for the City’s economic development program. Through various regulatory and non-regulatory programming, the implementation of the CEDS has been impressive, with sustained measurable results. The awards jury noted that the CEDS is in its fourth year of implementation and is already changing the face of the city and greatly expanding the role of traditional economic and development services. The City has experienced a 253 percent increase in housing activity and a 13 percent increase in business activity, which is clear evidence of implementation success. The awards jury also agreed that you can see the results in the industry sector. The Community Development Department now supports many new noteworthy pipeline projects, encompassing 25 significant residential developments of 1,800 housing units, as well as upscale retail and commercial projects that are being built or going through the development process, which are valued at almost $1 billion dollars. The awards jury thought this project was a great representation of place-keeping, not just place-making, with a strong focus on economic retention based on community. Over the last year, African Caribbean Market has worked to become a healthy and inviting community market by increasing and promoting their produce section, reorganizing their store layout to highlight food items by region, learning new skills on produce handling, and ultimately undergoing a complete market makeover based on community input. The primary goals of the project were to physically transform and beautify the market to increase shopper patronage and build community gathering opportunities, and thereby also highlight neighborhood good food availability. African Caribbean Market is a unique neighborhood market in City Heights specializing in foods from the Caribbean, and East and West Africa. This market participates in the Live Well Community Market Program, which is a project of Live Well San Diego: Healthy Works and implemented by University of California, San Diego Center for Community Health (UCSD CCH). This work supports Live Well San Diego, the County’s vision of a region that is Building Better Health, Living Safely, and Thriving. Funded in part by the Centers for Disease Control and Prevention and in part by USDA SNAP-Ed, an equal opportunity provider and employer. The study adapted a previous plan concept of the Park-to-Bay corridor that connects two of San Diego’s biggest assets Balboa Park and the Bay. The Park-to-Bay Project is a 2.1-mile corridor that reunites three communities that used to be one; Barrio Logan, South Eastern San Diego, and Golden Hill. The corridor also connects four parks; Balboa Park, Grant Hill Park, Chicano Park and Cesar E. Chavez Park by a linear park. The jury was impressed with the study’s goal to promote an active healthy community, as well as a safer and healthier environment for pedestrian, cyclist, and automobile users. The study utilizes research, precedents, site visits, site analysis, events like community planning groups and interviews to imagine how such a project can be accomplished. Finally, it develops a computer-based 3D model demonstrating the vision. F Street in Chula Vista presents an ideal opportunity for a complete transformation, considering that F Street is one of the few east-west streets in the City that cross Interstate 5 without an interchange. Proposed improvements included in the Master Plan include widening the existing sidewalk to establish a protected 12-foot wide Class I multi-use lane with designated areas for pedestrians and bicyclists, safety elements such as bulb-outs, high visibility crosswalks and mid-block crossings, travel lane improvements, and the recommendation of a roundabout at Bay Boulevard. The plan also proposes to adaptively reuse the former railroad bridge over Interstate 5 by transforming the bridge into a pedestrian plaza and multi-use path. The Chula Vista Elementary School District’s Safe Routes to School plan showcases the district as an innovative leader in the Safe Routes to School field in the San Diego and larger state of California. This program expanded upon previous SRTS efforts and included a comprehensive pilot project that would serve as a model for replication at schools across the district. This was the third major grant-funded SRTS project in the district to date and is the first district wide SRTS plan to have been completed. Over the two-year course of this program, students, parents, intergenerational community members, and other interested stakeholders participated in educational activities and contributed to data collection and engineering recommendations. The overwhelming inclusivity and collaboration demonstrated by district and partnering agencies and stakeholders resulted in a very successful program. In addition to traditional forms of outreach, such as surveys and workshops, during the first phase, the City partnered with the Escondido Educational Compact to conduct a Youth Leadership Academy “Planning Shark Tank” activity with 40 local high school students. City Planning staff provided a “Planning 101” overview to the students, then explained that the City was considering expanding home-based businesses in the study area. The students were challenged to develop an idea for successfully operating a business from their home, and “pitched” their ideas to a panel of Planning Staff who provided kudos and constructive feedback. In addition to learning about planning, the students were introduced to principles of economic development in a fun, innovative and relatable way. The City also expanded its creative and inclusive efforts to engage through a youth-based event at Central Elementary, where over one hundred 5th grade students participated in an art visioning program. Each student was asked to paint their vision of new development in the area. Each student was asked to discuss their vision and why it was important to them. Each art piece was celebrated as students presented their visions to the class. Artwork was incorporated into the final specific plan document as chapter cover art. The San Ysidro Community Engagement Strategy identified a need to connect and interact with a community that is underserved and underrepresented in local government. The engagement process was developed to support the update of the City of San Diego San Ysidro Community Plan. The awards jury felt that this project deserves to be recognized and celebrated. The jury noted that the public outreach process was extensive and included representation from the diverse community, which required interactive exercises and bilingual material. A dedicated Community Plan Update Advisory Committee served as the platform for 24 public meetings and workshops, a three-day charrette, a walk audit, Open House, and meetings with the San Ysidro Community Planning Group. The overall work effort resulted in a positive vision for the community. The unincorporated area of the county encompasses approximately 3,570 square miles, and is home to 26 distinct communities that vary from suburban densities adjacent to neighboring incorporated cities, to lower density rural communities surrounded by hillsides, deserts, and agricultural lands. The development pattern of these communities is directly related to how emissions are generated in the county and what opportunities exist for GHG reductions. Poway Road, the city’s primary three-mile retail corridor and “Main Street” has seen little change in decades. The street is dominated by large older single-use one-story buildings with large underutilized surface parking lots, high traffic speeds, and narrow sidewalks. In addition, very few people live in the corridor today due to lack of housing. The awards jury felt that this project will reshape Poway’s corridor, while still maintaining a “city on the country” atmosphere. To that end, the Poway Road Corridor Specific Plan included specific design guidelines for both private development and public realm. The Plan connects land use and transportation, bringing over 1,300 residential units in smart walkable neighborhoods, and 200,000 square foot of new commercial land uses. The USD Master Plan provides a framework to guide campus development of 180 acres over the next fifteen to twenty years. It is a document that records the vision and goals of the physical campus. This vision is updated to reflect the changes in demographics and the economy that affect higher education today and into the future. As part of the project, M.W. Steele Group organized and led over 100 meetings with campus leaders, 15 workshops with students, faculty and staff, and a campus “popup” event to solicit ideas and feedback from the campus population about the future of the USD campus. The jury thought that it was a beautiful, comprehensive plan. The plan includes significant commitments to enhanced mobility on and to campus, through expanded transit, new bicycle facilities, an improved pedestrian environment and handicap accessibility upgrades. The plan envisions an expanded campus tram that connects students across campus and to key transit stops in the city. It handles parking demand through innovative Transportation Demand Management strategies, such as transit, bike share, ride share and carpooling incentives.